There’s a feverishness to Far Cry that seems to seep from the games into the Ubisoft staff making them. Executive producer Dan Hay has been working on the series for three and a half years, and has finally reached the Heart of Darkness. Or should that be Far Cry 4’s Shangri-La? “You get to this point in the game where you leave the dev behind and become the player,” he intones. There’s a little of that madness in the footage below. Watch as an elephant throws a man from his trunk into the air in slow-mo, and a player picks the flailing sucker out of the sky with a shotgun blast. 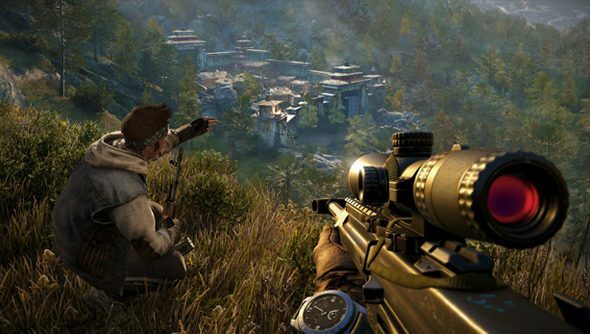 The base assault stuff is classic Far Cry – but find pieces of tapestry and you’ll open portals to ancient Shangri-La, where you’ll play as a long-dead warrior with far-fetched abilities. Yup, they’ve definitely lost it. But that’s how you know it’s going to be a good Far Cry game, right?